00:35:00 Makes 4 servings, 1/4 recipe (361 g) each. Makes 4 servings, 1/4 recipe (361 g) each. Love Thai food? Now you can make it at home! 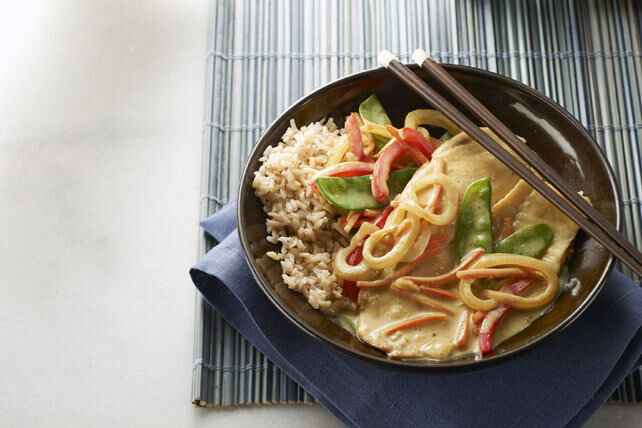 Our Thai Curried Tilapia Skillet recipe is inspired by a restaurant favourite but it's easy to prepare at home with our simple 3-step recipe. Cook vegetables, garlic and ginger in large saucepan sprayed with cooking spray on medium-high heat 2 to 3 min. or until vegetables are crisp-tender, stirring frequently. Add next 5 ingredients; stir. Bring to boil. Reduce heat to medium-low. Add fish; cover. Simmer 10 to 12 min. or until fish flakes easily with fork. Top with 2 Tbsp. chopped fresh cilantro or green onions just before serving. Looking to add more fish to your diet? This flavourful meal is sure to win over both you and your family. And as a bonus, the colourful carrots provide an excellent source of vitamin A, and the red pepper an excellent source of vitamin C.
Serving Size Makes 4 servings, 1/4 recipe (361 g) each.